The world, as seen by a thirteenth century map maker, shows the history, geography and destiny of humanity as it was understood in Christian Europe in the late 13th and early 14th centuries. Jerusalem is at the centre. The map, that belongs to Hereford Cathedral, measures 1.59 x 1.34 metres, and is constructed on a single sheet of vellum (calf skin). 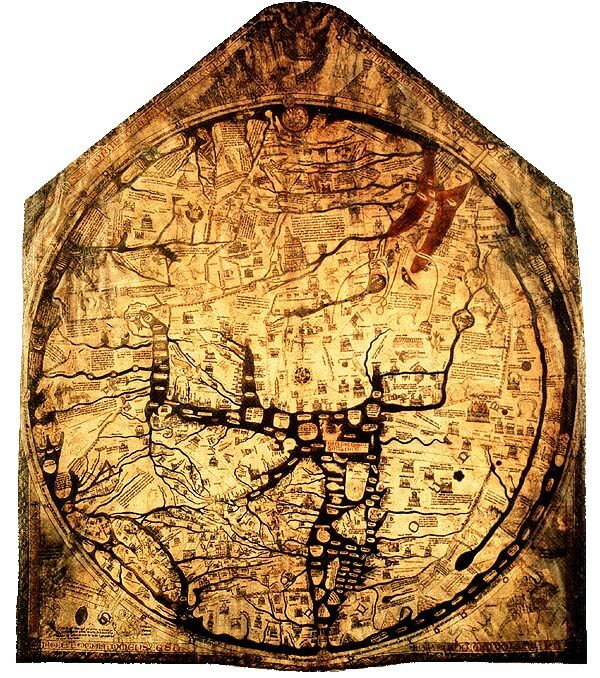 See more here Hereford Mappa Mundi Trust. The world, for our purposes, is the combined workings of mankind outside of God's purposes. The phrase, "The World, the Flesh and the Devil" comes from a church liturgy and sums up the forces working against God's Kingdom. In spite of Babylon having such a bad press in scripture, many nations and groups of nations appear to have a fascination for and affinity with Babylon. It is particularly obvious in Europe. The world is against God's church, so we will consider ways in which the world is subtly affecting the Kingdom of God in the Church and in our lives. The world will obviously state its position forcibly, but to what extent are Christians accepting the world's point of view? This is one important objective of wildolive - the commission to go home and tell people the truth about Israel. Sadly, the world's war on Israel is conducted through the church as well as outside it. This is because many in the church have allowed their understanding of events in and around Israel to be formed by the secular media rather than study of God's word. Paradigm shift - a complete lack of understanding between the friends and the opponents of Israel. The Palestinians are not merely the evil persecutors of Israel or the oppressed victims of Israel; depending upon your point of view. Although there is much deception in their marketing as the reason (Cause celebre) for world hatred of Israel, the people carrying this label are men and women for whom Jesus the Messiah died and for whom we must care, even while resisting the false claims of their leaders and advocates. The Palestinians are Arabs who are predominantly Muslims and mostly Jordanians, although the status of Christian Arabs living under Palestinian Authority control is difficult for them and hard to understand for the outsider. Arabs living in Israeli controlled Israel can not reasonably be called Palestinians, although the sympathies of Israeli Arabs vary widely. The next Lebanon War ? Weapons against Israel - Who hates Israel? This is apparent in the world's concerted efforts to blacken Israel's name and reputation, and to oppose Israel politically, militarily, commercially and in any other way that can be devised. Anti-Semitism has been re-branded as Anti-Israelism; not hatred of the Jew, but hatred of his state.